Erectile dysfunction can happen for many medical reasons, such as underlying disease processes of atherosclerosis and diabetes. Taking Viagra is one solution to help decreased libido in males, but there's a natural alternative you might not know of: Increasing your intake of the amino acid L-arginine. How does it work? In your body, L-arginine turns into nitric oxide. Erectile dysfunction is caused in part by poor penile circulation and nitric oxide cause blood vessels to widen, so there's some rationale for L-arginine having the same effect. Chicken is one of the top food sources of arginine. One chicken breast has 9 g of arginine and 70% of your daily recommendation for protein. Plus, it’s a super-healthy way to get protein and there are so many ways you can prepare it – roasted, baked, braised, poached, broiled, fried, you name it! One cup of peanuts packs 4.6 g of arginine. They’re also high in protein, vitamins B3 and E, folate and niacin. That said, you shouldn’t eat an entire cup in one setting because peanuts are very high in fat. It’s healthier to spread out one cup with a few one-quarter cup servings over a week. Peanuts are tasty as a snack or in a banana and peanut butter smoothie. Chickpeas, also called garbanzo beans, provide a healthy dose of protein and fibre all in one, making them a great choice for vegans and vegetarians. One cup of cooked chickpeas contains 1.3 g of arginine, 14.5 g of protein and 12.5 g of dietary fibre. Enjoy chickpeas in a curry or help yourself to hummus. One cup of roasted soybeans has 4.6 of arginine. Soybeans are also abundant in two essential minerals – magnesium and potassium. They make a fantastic healthy snack alternative! 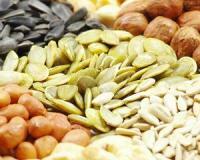 Animal sources aren’t the only way to get your arginine fix – pumpkin seeds boast 7 g per cup! They’re also a good source of minerals zinc and iron. Try them as part of a trail mix or as a crunchy salad topping. The five L-arginine-rich foods above are sure to help decreased libido in males. Make sure you add them to your diet!